No cycling. 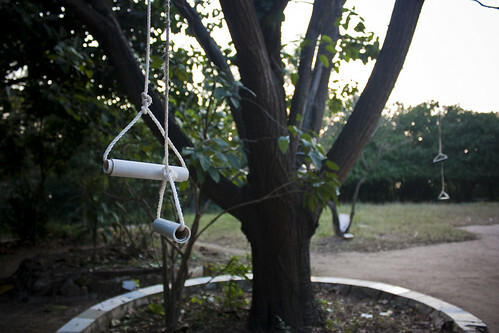 No ball-playing. No gambling. No remote-controlled vehicles. No walking on the grass. No fun. 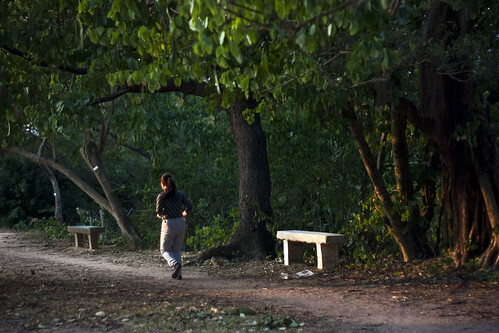 Hong Kong’s public parks are burdened by so many rules, they end up discouraging the very thing that parks are meant to provide: an escape from the many stresses of urban life. The same is true for many of the city’s other public spaces, from sidewalks to plazas and the ubiquitous “sitting-out areas” found in every neighbourhood. Caught in a stranglehold of metal fences, filled with concrete and ugly tile walls, they seem to discourage the lingering and spontaneous interaction that is cultivated by good public space. In response, Hong Kong people make their own public space. Throughout the city, leftover bits of concrete and greenery have been claimed by citizens and transformed, through piecemeal intervention and crafty ingenuity, into lively, informal gathering spots. Not far from my apartment in jam-packed Mongkok is a place I like to call the Hill With No Name. I call it this because, as far as I can tell, it has been overlooked by the gods of toponymy: it’s simply a small hill that was never developed, save for an underground reservoir and the Tsung Tsin Primary School. Even my friend Olivia, who grew up nearby and who attended the school as a kid, was stumped when I asked her what the hill was called. “I always just call it the hill behind Tsung Tsin,” she said. Photos from the 1970s show a small shantytown on the hill’s edge that was later demolished. Since then, the untamed green space has become a kind of unofficial park. 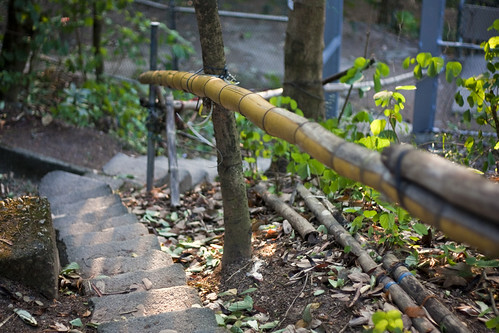 Steps made from wood planks and old doormats, lined by handmade bamboo railings, make their way up the hill. 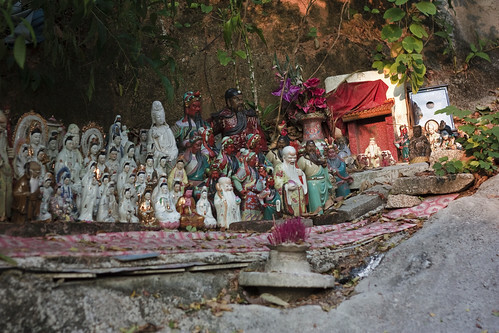 Styrofoam Chinese altars sit next to the trunks of giant banyan trees; on one side of the hill, there’s a collection of Buddhist figurines left by people who don’t want to invite bad luck by throwing them in the trash. Every day, people from the surrounding neighbourhoods come here for a bit of exercise, and they leave behind kitchen chairs and office recliners for people to sit on. 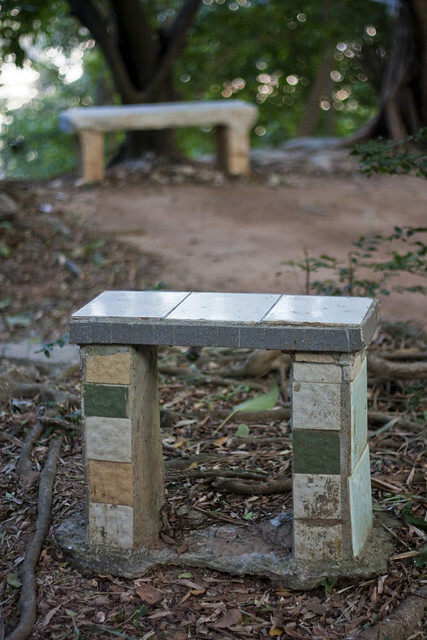 Near the top of the hill, benches have been fashioned out of cement blocks and mismatched bathroom tiles. Old people visit the hill to play mahjong in the woods and to work out on ad hoc exercise equipment strapped to tree branches. Though the elderly might take the initiative, the appeal of informal space crosses generational lines. The narrow laneway behind Hollywood Road in Central is filled with old chairs and folding tables; during the day, they are used by old men to play cards, and at night, they are taken over by drinkers from a nearby. 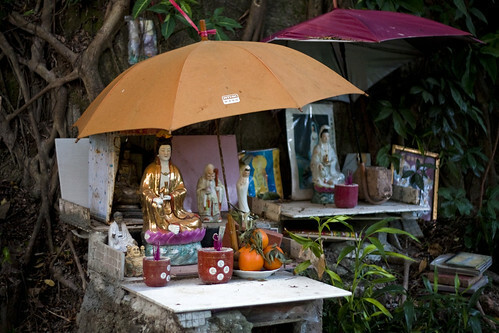 The most spectacular of these makeshift public spaces can be found in a waterfront cargo yard near Kennedy Town, on the western edge of Hong Kong Island. In the day, this is the domain of small-time barge operators who use it to unload shipping containers from their boats. But after the sun sets and the forklifts are put to rest, hundreds of people from the nearby apartment towers descend on the yard to enjoy the cool sea breeze and vast open spaces. An eclectic crowd takes charge on a hot summer night, under the amber glow of streetlights. Cyclists speed up and down the length of a pier jutting into the harbour, stereos blasting from the back of their fold-up bikes. 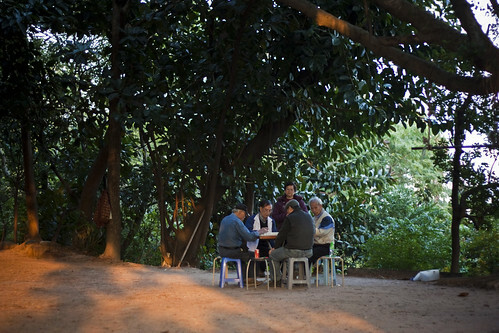 Young and old men sit with fishing lines, waiting for a catch. A mother and daughter practice dance moves. Big groups of immigrant women sit chatting in Hokkien. A husband and wife sit on a wood pallet, watching a movie on a portable DVD player. Students from the nearby University of Hong Kong dangle their legs over the pier’s edge, passing a bottle of wine between themselves. Last year, I visited the cargo yard during Mid-Autumn Festival, a time when Chinese people gather outside to light lanterns and watch the full moon. It was more happening than I had ever seen it. Groups of friends barbecued and hooked up televisions to portable generators so they could sing karaoke. One family flew a kite in the night sky. Later in the evening, teenagers arrived with cases of beer and empty mooncake tins to engage in the traditional activity of wax-burning, or bou laap. None of these activities is allowed in Hong Kong’s city parks, unless it takes place in a designated zone vetted by bureaucrats, surrounded by fences and locked up tight at 11pm. But this isn’t officially-sanctioned public space. There is nobody here telling you how to behave and how to enjoy yourself. The cargo yard, so inhospitable during the day, seems like an odd space to hang out. But when you wander through the nightscape of shipping containers and moored barges, the city skyline in the distance, waves lapping against the shore, you understand the appeal: freedom. This story was first published in Spacing magazine’s first-ever national edition. Read more at Spacing’s website. This entry was written by Christopher DeWolf , posted on Thursday August 18 2011at 07:08 am , filed under Asia Pacific, Public Space, Society and Culture and tagged Behaviour, Hong Kong, Informal Space, Kowloon, Street Furniture, Streetlife, Urban Design, Victoria Harbour . Bookmark the permalink . Post a comment below or leave a trackback: Trackback URL. I agree that HK park regulations seem to restict pretty much anything that one should normally be allowed to do in parks. Recently Quarry Bay park decided to take a softer approach. Instead of ‘No skateboarding’ you are now encouraged by the signs to ‘pack your skateboard and enjoy the sea view’. Hmm. Perhaps at mid-autumn festival it’ll be ‘you don’t need a kite to enjoy the moon’!